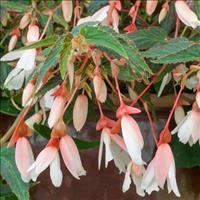 Cascading sheets of rosy pink blooms cover the dark green pointed leaves. 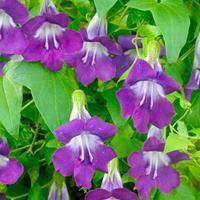 A lovely shade and heat tolerant plant that blooms all season long, its easy care just adds to its charms. Provide welldrained soils and water when soil dries 1-2” down. MISTRAL™ trademark is owned by of Selecta Klemm GmbH & Co. KG. Plant-lust kicked in as soon as I laid my eyes on this gorgeous climbing vine with the dark-eyed smoldering orange-red blooms! I had to have it, now you can too! Easy in rich, moist, yet well-drained soils. Flowers about an inch wide. Large velvety blossoms have unique dimpled centers and differing shades of rich rose pink. 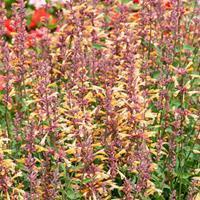 A summer long show of flowers is yours, for it really comes into its own in high summer in fertile, humus rich soils. A touch of afternoon shade is welcome where heat is unrelenting. 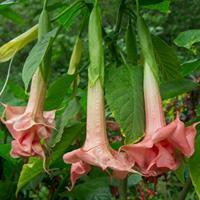 This variety has romantic ruffled blooms over a foot long, with an intoxicating scent in the evening hours. 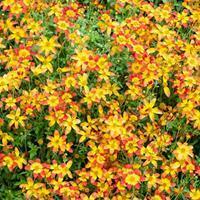 They are great patio specimens, and are fast growers that need regular fertilizer, water, and moving to roomier pots as the summer progresses. A standout! Poisonous.